Follow the story through the woods. "Oh help! Oh no! It's a gruffalo!" Image by Colin Baxter on Flickr|Creative Commons. A familiar tale to most parents, The Gruffalo by Julia Donaldson is a story which can be told by heart by many children. So imagine their delight when they find out that they too can enter the woods by following The Gruffalo Trail, a brand new experience at Ardkinglas Woodland Garden in Cairndow, Argyll. Fans of the books and films can step into a world where the characters would be most at home on the atmospheric trail, where excerpts from the Scots version of the story are displayed in situ, and come face-to face with steel sculptures of both the Gruffalo and the Mouse. The walk heads down to the river bank beneath mature trees, ending near the lochan where water lilies flower in the summer. On the hunt for more woodland trails where you and your family might bump into some unusual, and entertaining inhabitants? Discover the Woodland Secrets adventure playground and trails in the gardens of Castle Fraser, where there are wooden creations. A treehouse, giant xylophone and numerous enchanting carvings line the paths, as well as magnificent views of the local hills. 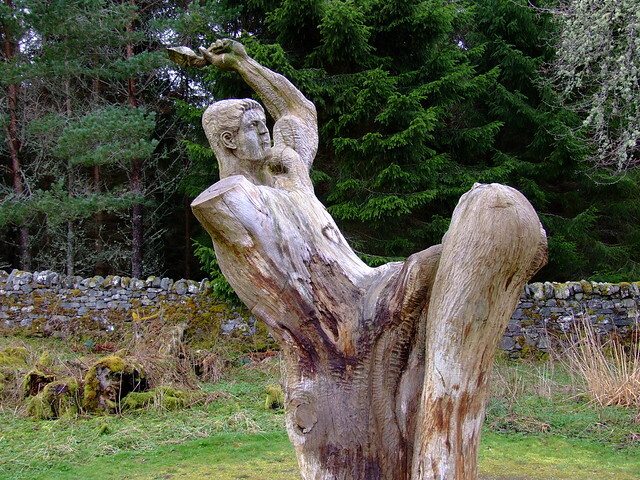 Both young and old can appreciate the sculptures on the Frank Bruce SculptureTrail by the Feshie River, a short easy walk where otherworldly wood and stone artworks seem to speak in spiritual conversation with the surrounding woodlands. 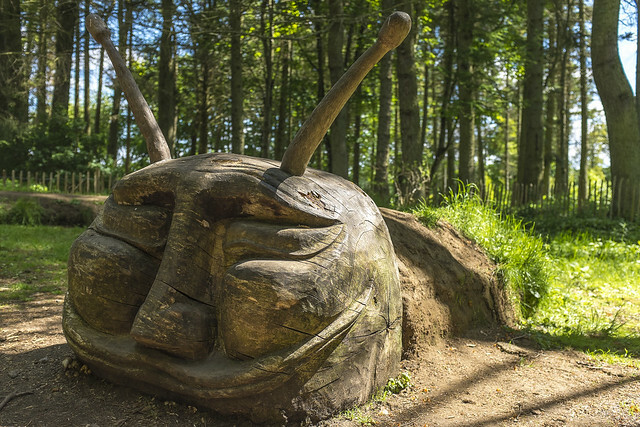 New playful artworks have sprung up recently at Formonthills Community Woodland, so why not take a walk in these woods on the lower Lomond Hills? The grand wooden totem pole is carved with a variety of local animals, from the earth worm at the base, to the buzzard at the top. Walk to the clearing where you’ll find a new circle of engraved standing stones, and look out for other woodland sculptures en route! You can meet a badger, hedgehogs, a fox, a falcon and an owl on a walk in Kinnoull Woods. Pete Bowsher, the current Scottish Open Chainsaw Carving Champion, drew inspiration from the real wildlife in the area to create these fantastic sculptures. Are you aware that some of Scotland’s woods are home to magical Glingbobs and Tootflints? Setting up homes in a variety of tree stumps, hollows and trunks, they are rarely spotted but their houses are easily recognisable thanks to the wooden windows and doors. Follow trails and maps at woods including at Pressmennan in East Lothian, Cambo Estate in Fife and in Bellsquarry Wood in Livingston, West Lothian. Let us know what you discover on a Scottish woodland walk by leaving a comment or joining the conversation on Facebook or Twitter. Keep exploring great woodland adventures to enjoy with all the family.